Last Wednesday night, we decided I should fly out on Thursday morning to go be with my family and go to the funeral for my grandmother. Kelly encouraged me to go and he would work from home on Thursday and Friday and take care of the kids. I had assumed that was out of the question, but I'm finding my sweety is full of surprises. Elisabeth had a cold, and he and Jonah were showing the beginning symptoms of the same cold. So Daddy took care of two sick toddlers for three days and two nights, feeling sick himself and managed to actually get work done. In addition to all that, he managed to get Elisabeth to nap through the day without mom. So Elisabeth is officially weaned and will go to sleep for a nap and at night without nursing and without white noise (the mp3 player broke over the weekend). AND due to being sick, Jonah fell asleep in the afternoon of his own accord while I was away. When I got back we continued to put him down for a nap (he has been super cranky) and he has napped everyday this week so far. A pattern we hope to continue. (Jonah has not napped consistently in over a year.) I think I need to go away more often! 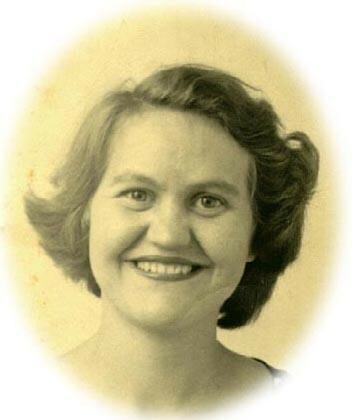 My grandmother passed away peacefully this morning in her sleep. 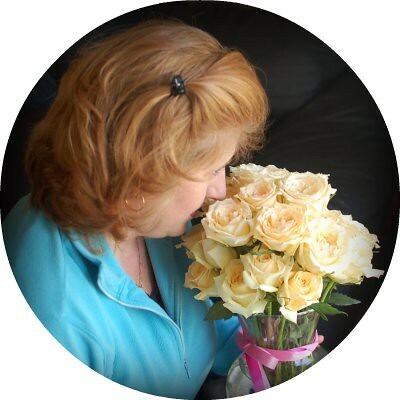 She dealt with a bleeding disease called Hereditary hemorrhagic telangiectasia her whole life and in this last year was having a blood transfusion almost weekly. She was experiencing other complications as well that made for a very delicate physical situation these last couple of years. She also had a handicapped right side due to an apparent stroke as a baby or young child - we're not really sure the cause. She had a CT scan a year or so ago and it was very revealing. She joked that she only had half a brain. That was her perspective on everything in life - her glass was always half full, never half empty. Despite, or perhaps, in spite of, her physical challenges and the social stigma of being "Bill Halbert's little crippled girl," she went to school, became a teacher, and had a family. She suffered additional loss and hardship including the sudden and violent death of my grandfather, but there was never a person who endured all of this as gracefully as she. She clung to her Lord and Savior with a simple, childlike faith, and found joy wherever she could find it. She loved reading books and that was a big part of her life especially these last years as her mobility decreased. She loved watching ice skating and wondered what it would be like to be able to do that or to even run. Her handicap kept her from experiencing those things on this earth. But now, she is no longer trapped in her marred and imperfect body. Oh, what she can do now and the love that she is experiencing in the enveloping arms of The Father. All wounds and imperfections are wiped away and there is such Joy. While I may be shedding some tears as I write this, they are truly tears of joy. One of my earliest memories of my grandmother is going to church with her and Papaw and singing, "Ain't no grave gonna hold my body down." Praise God, that one day Mamaw will get her body back and it will be made new and perfect. Amen. This is for you mamaw. Love you! We had a fabulous weekend! We watched Livi on Friday night so our friends could have a date night. The kids had a great time. Elisabeth hangs right with the older two and has taken to calling Livi Boppy and squeals with delight when she arrives. Saturday I was feeling like a change and primped and colored my hair. Here I am with my Valentine's Flowers and my red Valentine's Hair. That wasn't really what I was going for when I started, but it'll do for now. I actually like it better in this picture than I do when I look in the mirror. The funny thing is I have tried to go for this color in the past and ended up with something else. We got a couple of inches of snow here, so we then went out to play in the snow. The last snow was mostly ice so we didn't build a snowman, but this time the snow was perfect for building one. That evening our friends watched the kids while we had dinner and then went Rock Climbing (I'll post more on this later). Sunday morning Kelly made some low carb pancakes with Almond meal (delicious!) and we cleaned up the house a bit. Then we went to the Auto Show at the fairgrounds. It was a lovely weekend all around. I hope you all had a great weekend too! Jonah and Elisabeth are Growing Up: Driving Already! Yesterday was a day of firsts for Elisabeth. First of all, she peepee'd in the potty for the first time ever. She has been very interested as a result of Jonah's new found consistency. Jonah has been going potty both number 1 and 2, at home and out since the new year (accidents not withstanding) - Yay! 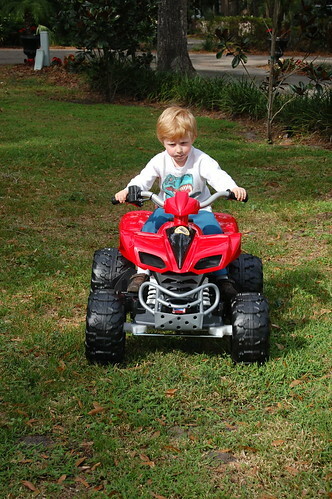 Then, she rode the ATV by herself - meaning that she figured out where the gas pedal was and made it go (with Daddy hovering a few inches away of course.) 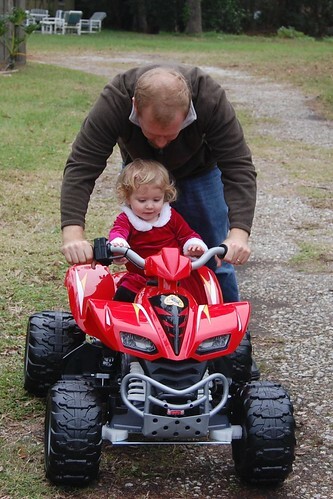 When Jonah first got the ATV at Christmas we put her on it and Daddy pushed the pedal a little. Then, she didn't seem to like it to move; she just liked sitting on it. Jonah was a bit afraid of it at first too. But by day two, he had it figured out. Well, we prayed and hoped and finally some snow. Woot! We were excited to get out in it with the kiddos.